Just a couple stair steps into and out of a house, can really throw off your rhythm or even result in damages or injury. How much easier it is when you have a ramp like this to take out the steps! In the last month we have comfortably rolled two large studio pianos over this ramp which would have been a b**** to move one step at a time. It is also much easier and quicker to roll–say 200 boxes–up and down this ramp, than to negotiate stair steps each time. The downside to this ramp is it is rather large and bulky to be truly “portable.” I’m going to check out the lighter “Stair Step Ramps” that you see on the interstate tractor trailers. 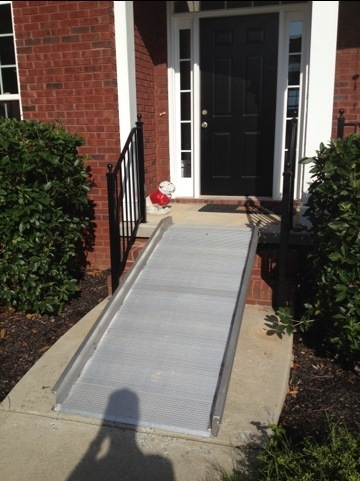 This entry was posted in Moving Equipment, Moving Up Stairs, Residential Moves and tagged ramp, Stair Steps by Bob McGregor. Bookmark the permalink.